There are a number of languages in Morocco, but the two official languages are Modern Standard Arabic and Amazigh (Berber). Moroccan Arabic (known as Darija) is the spoken native vernacular. The languages of prestige in Morocco are Arabic in its Classical and Modern Standard Forms and French, the latter of which serves as a second language for many Moroccans. According to a 2000–2002 survey done by Moha Ennaji, author of Multilingualism, Cultural Identity, and Education in Morocco, "there is a general agreement that Standard Arabic, Moroccan Arabic, and Berber are the national languages." Ennaji also concluded "This survey confirms the idea that multilingualism in Morocco is a vivid sociolinguistic phenomenon, which is favoured by many people." There are 20 to 25 million Berber speakers in Morocco, about 60 to 80% of the population. French retains an major place in Morocco, as it is taught universally and serves as Morocco's primary language of commerce and economics, culture, sciences and medicine ; it is also widely used in education and government. 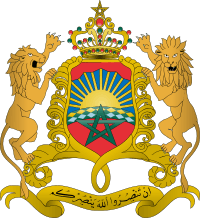 Morocco is a member of the Francophonie. Arabic, along with Berber, is one of two Morocco's official languages, although it is the Moroccan dialect of Arabic, namely Darija, meaning "everyday/colloquial language"; that is spoken or understood, frequently as a second language, by the majority of the population (about 85% of the total population). Many native Berber speakers also speak the local Arabic variant. Arabic in its Classical and Standard forms is one of the two prestige languages in Morocco. Aleya Rouchdy, author of Language Contact and Language Conflict in Arabic, said that Classical/Modern Arabic and French are constantly in conflict with one another, but that most Moroccans believe that the bilingualism of Classical Arabic and French is the most optimal choice to allow for Morocco's development. In 1995 the number of native Arabic speakers in Morocco was approximately 18.8 million (65% of the total population), and 21 million including the Moroccan diaspora. 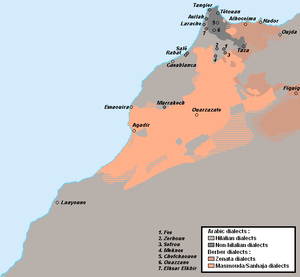 As a member of the Maghrebi Arabic grouping of dialects, Moroccan Arabic is similar to the dialects spoken in Mauritania, Algeria, Tunisia, and Libya (and also Maltese). The country shows a marked difference in urban and rural dialects. This is due to the history of settlement. Originally, Arabs established centers of power in only a few cities and ports in the region, with the effect that the other areas remained Berber-speaking. Then, in the 13th century, Bedouin tribes swept through many of the unsettled areas, spreading with them their distinct Arabic dialect in the non-urbanized areas and leaving speakers of Berber in isolated areas in the more mountainous regions. Moroccans learn Standard Arabic as a language. It is not spoken at home or on the streets. Standard Arabic is frequently used in administrative offices, mosques, and schools. According to Rouchdy, within Morocco Classical Arabic is still only used in literary and cultural aspects, formal traditional speeches, and discussions about religion. Moroccan 'Darija' Arabic, along with Berber, is one of two languages spoken in homes and on the street. The language is not used in writing. Abdelâli Bentahila, the author of the 1983 book Language Attitudes among Arabic–French Bilinguals in Morocco, said that Moroccans who were bilingual in both French and Arabic preferred to speak Arabic while discussing religion; while discussing matters in a grocery store or restaurant; and while discussing matters with family members, beggars, and maids. Moha Ennaji, author of Multilingualism, Cultural Identity, and Education in Morocco, said that Moroccan Arabic has connotations of informality, and that Moroccan Arabic tends to be used in casual conversations and spoken discourse. Ennaji added that Bilingual Moroccans tend to use Moroccan Arabic while in the house. Berbers generally learn Moroccan Arabic as a second language and use it as a lingua franca, since not all versions of Berber are mutually intelligible with one another. Hassānīya, is spoken by about 0.7% of the population mainly in the southern sahara regions of Morocco. Communities of speakers exist elsewhere in Morocco too, especially in the metropolitan areas of Agadir, Marrakech, Rabat and Casablanca. 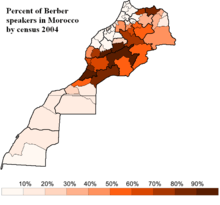 The exact population of speakers of Berber languages is hard to ascertain, since most North African countries do not – traditionally – record language data in their censuses (An exception to this was the 2004 Morocco population census). The Ethnologue provides a useful academic starting point; however, its bibliographic references are inadequate, and it rates its own accuracy at only B-C for the area. Early colonial censuses may provide better documented figures for some countries; however, these are also very much out of date. The number for each dialect is difficult to estimate. Berber serves as a vernacular language in many rural areas of Morocco. Berber, along with Moroccan Arabic, is one of two languages spoken in homes and on the street. The population does not use Berber in writing. Aleya Rouchdy, author of "Language Contact and Language Conflict in Arabic," said that Berber is mainly used in the contexts of family, friendship, and "street". In her 2000–2002 research, Ennaji found that 52% of the interviewees placed Berber as a language inferior to Arabic because it did not have a prestigious status and because its domain was restricted. Ennaji added that "[t]he dialectisation of Berber certainly reduces its power of communication and its spread." Speakers of Riffian dialect were estimated to be around 1.5 million in 1990. The language is spoken in the Rif area in the north of the country, and is the smallest Berber dialect in Morocco, by number of speakers. The Tashelhit language is considered to be the most widely spoken as it covers the whole of the Region Souss-Massa-Drâa, and is also spoken in the Marrakech-Tensift-El Haouz and Tadla-Azilal regions. Studies done in 1990 show around 3 million people, concentrated in the south of Morocco, speak the dialect. Central Morocco Tamazight is the second Berber language in Morocco. A 1998 study done by Ethnologue, shows that around 3 million people speak the language in Morocco. The language is most used in the regions Middle Atlas, High Atlas and east High Atlas Mountains. Other Berber dialects are spoken in Morocco, as the Senhaja de Srair and the Ghomara dialects in the Rif mountains, the Figuig Shilha (not to be confused with Atlas Shilha) and Eastern Zenati in eastern Morocco, and Eastern Middle Atlas dialects in central Morocco. This nomenclature is common in linguistic publications, but is significantly complicated by local usage: thus Shilha is sub-divided into Shilha of the Dra valley, Tasusit (the language of the Souss) and several other (mountain) dialects. Moreover, linguistic boundaries are blurred, such that certain dialects cannot accurately be described as either Central Morocco Tamazight (spoken in the Central and eastern Atlas area) or Shilha. 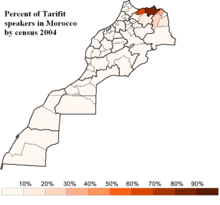 The differences among all Moroccan dialects are not too pronounced: public radio news are broadcast using the various dialects; each journalist speaks his or her own dialect with the result that understanding is not obstructed, though most southern Berbers find that understanding Riff requires some getting used to. French and Arabic (MSA) coexist in Moroccan administration and business. Within Morocco, French, one of the country's two prestige languages, is often used for business, diplomacy, and government. French serves as a lingua franca. Aleya Rouchdy, author of Language Contact and Language Conflict in Arabic, said that "For all practical purposes, French is used as a second language." Different figures of French speakers in Morocco are given. According to the OIF, 33% of Moroccans speak French, among them 13.5% fully francophone and thus bilingual with one of the other Moroccan languages, and 19.5% partially francophone. According to the 2004 census, nearly 69% of literate people can read and write French. About 5 million Moroccans speak Spanish, especially in the northern regions. The use of Spanish in northern Morocco and the Moroccan Sahara derives largely from the fact that Spain had previously occupied those areas. In these regions Spanish is commonly used in public discourse and Spanish-language television is a common medium. After Morocco declared independence in 1956, French and Arabic became the main languages of administration and education, causing the role of Spanish to decline. English, while still far behind French and Spanish in terms of the number of speakers, is rapidly becoming the second foreign language of choice among educated youth, after French. As a result of national education reforms entering into force in late 2002, English will be taught in all public schools from the fourth year on. English is spoken sporadically in the business, science and education sectors but its usage and learning have grown over the last decade, especially since 2002, when English instruction was introduced from the 7th grade in public schools. Because it is the primary international language worldwide and because there are no colonial overtones, the language gained prestige within Morocco. In a survey held by Ennaji in the summers of 2000, 2001, and 2002, 58% of the respondents said that English was their favorite foreign language because it is the primary international prestige language. Ennaji, Moha. Multilingualism, Cultural Identity, and Education in Morocco. Springer Publishing, January 20, 2005. p. 127. ISBN 0387239790, 9780387239798. Rouchdy, Aleya. Language Contact and Language Conflict in Arabic. Psychology Press, January 6, 2003. Volume 3 of Curzon Arabic Linguistics Series, Curzon Studies in Arabic Linguistics. p. 71. ISBN 0700713794, 9780700713790. Stevens, Paul B. "Language Attitudes among Arabic-French Bilinguals in Morocco." (book review) Journal of Language and Social Psychology. 1985 4:73. p. 73–76. doi:10.1177/0261927X8500400107. 1 2 Deroche, Frédéric (2008-01-01). Les peuples autochtones et leur relation originale à la terre: un questionnement pour l'ordre mondial (in French). L'Harmattan. ISBN 9782296055858. 1 2 "La Francophonie dans le monde." (Archive) Organisation Internationale de la Francophonie. p. 16. Retrieved on 15 October 2012. 1 2 3 4 5 6 7 8 9 Youssef Maaroufi. "Recensement général de la population et de l'habitat 2004". Site institutionnel du Haut-Commissariat au Plan du Royaume du Maroc. ↑ "British Council – United Kingdom" (PDF). britishcouncil.org. 1 2 3 Ennaji, p. 164. ↑ Ethnologue report for language code: shi. Ethnologue.com. Retrieved on 2011-07-23. 1 2 3 4 5 6 Rouchdy, p. 71. ISBN 0700713794, 9780700713790. ↑ Ethnologue report for language code: ary. Ethnologue.com. Retrieved on 2011-07-23. 1 2 3 Ennaji, p. 162. 1 2 3 4 5 Rouchdy, p. 73. 1 2 Ennaji, p. 127. 1 2 Ethnologue report for language code: rif. Ethnologue.com. Retrieved on 2011-07-23. ↑ Ethnologue report for language code: tzm. Ethnologue.com. Retrieved on 2011-07-23. ↑ "Morocco." (Archive) CIA World Factbook. Retrieved on 13 October 2012. "French (often the language of business, government, and diplomacy)"
↑ "Bitter Fruit: where Donegal's jobs went." Irish Independent. Saturday January 16, 1999. Retrieved on October 15, 2012. "Behind the locked gates and the sign saying `Interdit au Public' (forbidden to the public) French is the lingua franca in Morocco) I[...]"
Wikimedia Commons has media related to Languages of Morocco. Bentahila, Abdelâli. "Language attitudes among Arabic-French bilinguals in Morocco". Multilingual Matters (Clevedon, Avon, England), 1983. Series #4. ISBN 0585259763 (electronic book), 0585259763 (electronic book), 9780585259765 (electronic book). Bentahila, Abdelâli. "Motivations for Code-Switching among Arabic-French Bilinguals in Morocco." Language & Communication. 1983. Volume 3, p. 233 – 243. ISSN 0271-5309, EISSN 1873-3395, doi:10.1016/0271-5309(83)90003-4. Chakrani, Brahim. "A sociolinguistic investigation of language attitudes among youth in Morocco." (dissertation) ProQuest. ISBN 1124581251. UMI Number: 3452059. Keil-Sagawe, Regina. "Soziokulturelle und sprachenpolitische Aspekte der Francophonie am Beispiel Marokko (Manuskripte zur Sprachlehrforschung, 38) by Martina Butzke-Rudzynski" (review). Zeitschrift für französische Sprache und Literatur. Franz Steiner Verlag. Bd. 106, H. 3, 1996. p. 295–298. Available at JStor. The document is in the German language. Lahjomri, Abdeljalil. Enseignement de la langue francaise au Maroc et dialogue des cultures (Teaching of the French Language in Morocco and Dialogue of Cultures). Francais dans le Monde. 1984. p. 18–21. ERIC #: EJ312036. The document is in the French language. See profile at ERIC. Salah-Dine Hammoud, Mohamed (1982). "Arabization in Morocco: A Case Study in Language Planning and Language Policy Attitudes." Unpublished PhD dissertation for the University of Texas at Austin, Available from University Microfilms International, Ann Arbor, Michigan.